The Baja tacos at Piper Down. My former neighbor made the best vegan tacos: a carrot-potato mash in a deep-fried corn tortilla. Simple, starchy and something fried—the taco trifecta. I’ve been searching through vegan cafes, posh restaurants and taco trucks all over this city for another one like it. I used to be addicted to Squatters tofu tacos. But, alas, I grew tofu-tired and longed to explore tastier options. The mushroom tacos at Taqueria 27 excited me for a while—beauties indeed—but they just didn’t leave a lasting impression. And I’ve consumed plenty of what the best taco trucks in the city have to offer, filled with rice and (hopefully lard-free) beans—quite good, but beans are meant to be tucked safely inside a tightly-folded flour tortilla (you know, a burrito) for a reason. Frisch Compassionate Eatery has a Taco Tuesday creation of lentils, pumpkin seeds and cherry tomatoes. Good, but not Mexican. 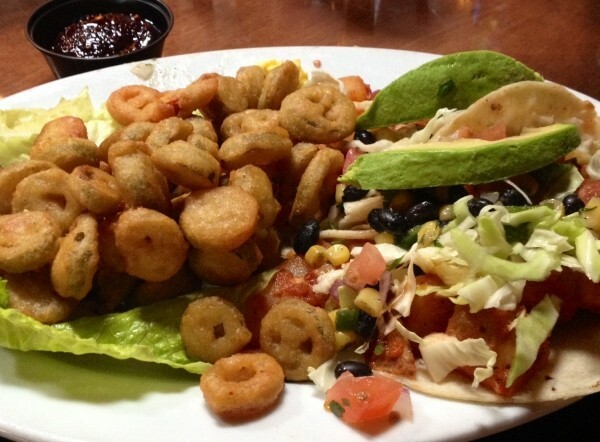 Cafe Solstice offers similar green goodness in a taco shell. But I’m not really looking for nutrients in my taco. Miso and sunflower seeds do not a Mexican taco make. But after an arduous search, I’ve finally found my soul mate on a plate—improbably, in an Irish-style pub. Right now, my favorite vegan tacos are at Piper Down, a place after my Irish-Mexican heart. I can get a shot of whiskey and a taco. It’s been a long time coming. Piper Down’s Baja potato tacos—off the generous vegan Green Page menu—are a winning trio of smokin’ hot grilled potatoes drenched in ranchero sauce, cold, crispy shredded cabbage and salsa fresca in a soft corn tortilla. No tofu, but plenty of sliced avocado. The real show-stopper is on the side: tempura-battered red and green jalapeños cover half the plate, escorted by raspberry jelly for dipping. It’s a duo so spicy-sweet even omnivores will swoon. Grab an ice-cold beer to help you handle the heat.